I guess we’ve all been to good weddings and not-so-good weddings. We’ve been to gloriously God-honoring weddings and embarrassingly God-dishonoring weddings. The best weddings, at least in my assessment, are the ones where the couple is willing to step out of the spotlight to ensure that attention is focused squarely on God. The best weddings are the ones where the couple makes much of God, where he is at the very center of it all. Weddings are big business today. As comedian Jim Gaffigan says, “Weddings are an important event where we spend a lot of money so the bride can pretend to be a princess and marry her prince and live happily ever after.” He isn’t far from the truth. The bride is taught that this is her day, her day to shine, the day to fulfill her dreams and fantasies. And in too many cases, even among Christians, Christ is shoved to the margins. 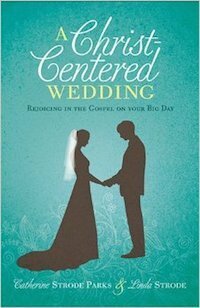 Into the fray step Catherine Strode Parks and Linda Strode with their new book A Christ-Centered Wedding. They write, “Marriage is one of God’s good gifts. It is a blessing to all of creation, and it’s a beautiful picture of Christ’s relationship with the church. Before you can experience the joy of this gift, though, you need to get through the wedding, and the wedding planning. This can be either an uplifting, encouraging experience or a frustrating exercise in trying to please everyone and failing. Many times it’s a combination of the two.” They want to make sure that the wedding and the preparation are uplifting rather than agonizing and that the ceremony is Christ-focused rather than self-focused. And so they wrote a book about rejoicing in the gospel on your big day. And it’s a good book. A Christ-Centered Wedding is a guide to Christians who want their wedding to point to Christ and to be a reflection of the great gospel message. They cover both the theology of marriage and the practical side of the ceremony, making this a book that is helpful in both theory and application. They begin with a biblical explanation of what marriage is, why it exists, and how it is meant to honor and glorify God. They show how, from the very beginning, God intended marriage to be a reflection of the relationship between Christ and the church. With that in place, they move to the practical side of weddings, and cover premarital counseling, wedding locations, planning, time lines, music, finances, vows, and pretty much everything else you could think of. They draw from many other people, giving a variety of interesting and helpful ideas. What sets this book apart from the million-and-one other books on weddings is the constant focus on Christ. Every decision matters, from music to flowers, from dresses to sermon texts, from vows to honeymoons. Every decision matters because every decision can be made in a way that honors Christ and focuses on him, or a way that dishonors Christ and steals his glory.